We are happy to announce our newest program, the One-Day English Immersion Getaway in Bosque Escondido Arte, Spain! A full day program with several activities which ensure an unforgettable day in one of the most beautiful areas of Spain, in Asturias. 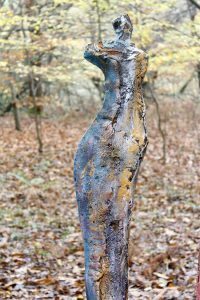 The programs are going to take place in a forest where Carmen Castillo, sculptress works and lives, therefore many of her works are in her “outdoor museum” where participants and volunteers are going to spend the major part of the day. Asturias is also known for its wonderful natural values and vitality. Its people, villages and the hundreds of rivers, the ocean, the mountains and the fresh air all contribute to a unique and extremely peaceful experience. For the lovers of active recreation, the location is just perfect to practice some sports, such as yoga. And do you know any better place for that than a quiet, healthy and private forest, the Bosque Escondido Arte in the neighbourhood of Parque Natural de Picos de Europa? This is one of the richest in nature areas of Spain, a real jewellery box rarely visited by foreign tourists, saved for the true fans of nature. Volunteers are expected to take an active part in the activities and conversations in English with the Spaniards and contribute to their development with correcting their mistakes. In exchange for the participation we provide the full program for free which includes meals, yoga session, hiking, group activities, coffee and teas and most importantly a life-long, unique experience. If you need, we can even help you with transportation once you arrived to Infiesto. Upcoming dates are: 7th April, 5th May, 2nd June. Don’t hesitate to apply and become a member of our community!